This kitchen remodeling project was a labor of love...the design was for my own family. The process took over a year but it was well worth the wait. For this massive undertaking, I turned to designer donna venegas of Venegas & Co., who came up with a masterful space plan. We took the original kitchen down to the studs, moved walls, created a better flow, increased accessibility and with the addition of several windows, we added more light. The project launched with the installation of new floors with radiant heat throughout. An extensive lighting and sound system design was created to maximize light and ambiance. Donna sourced the custom cabinetry that I chose to house state of the art appliances along with a must for all of my kitchens, refrigerator beverage drawers. A casual seating space is located at the kitchen island which also holds the beverage drawers. Just around the corner, a larger seating area for 10 in the new breakfast area. The kitchen dining addition was designed as an informal space, complete with high ceilings, tall windows and access to the grounds. One of my favorite elements in this room, the reclaimed barn wood beams. They add texture and a sense of comfort. For privacy and convenience, I added a powder room just outside the kitchen with accessibility from the formal dining room. The room has a great mix of modern, vintage and antique elements. 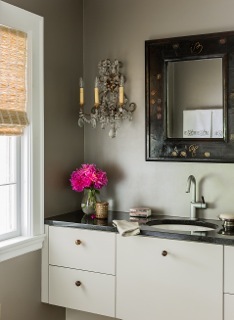 The antique Italian sconces soften the modern lines of the custom cabinetry while the lacquer finish chinoiserie mirror adds a little vintage edge. The small details in this space made a huge impact on the overall look. The chevron pattern of the backsplash gives depth and of course style to the cooking area. Hardware choices can create an entirely new dimension to the personality of the room, which is why it was so important to find the right shape, size and material for the drawer cabinet pulls and knobs. My friend Donna led me to one of her favorite sources for cabinet hardware, Needham Lock & Decorative Hardware. that's where i found the perfect pieces to finish the kitchen. i chose a line made by Sun Valley Bronze, a foundry located in hailey, idaho. artisans there hand-craft and hand finish every piece.